The distinction between managers and leaders is of paramount importance in the modern business environment. Simply defined, managers direct, leaders inspire. Managers demand respect and exercise authority. Leaders respect others and enhance their freedom for individual initiative. Managers promote efficient execution of routine activities. Leaders release and direct the energy of the organization to propel it into higher levels and wider circles of accomplishment. Effective managers promote horizontal expansion of the activities over which they exercise control. Inspiring leaders promote vertical development and creative initiative, even in areas over which they have no organizational power. Efficient managers insist on strict adherence to policy and procedure. Dynamic leaders strive to maximize energy, commitment, effort and resourcefulness. Managers often mistake the submissive behavior of subordinates as an accurate reflection of their own worth. Perceptive leaders know their own weaknesses and know that others know them too. Most anyone can exercise authority when the power to enforce obedience is placed in his hands by virtue of his position within an organization. Great leaders are those who generate the power for accomplishment by the strength of their own personalities in circumstances where organizational authority does not exist and obedience cannot be enforced. Strong managers enjoy the use of power and feel energized by exercising their authority. Insightful leaders understand that the only one who feels energized by the exercise of authority is the one who exercises it. The process by which a strong manager evolves into an inspiring leader is beautifully depicted in a recent film entitled King Arthur. Arthur and his knights have captivated the imagination and entranced the hearts of millions the world over. The triangular love affair between Arthur, Sir Lancelot and Lady Geneviere, the magic of Merlin and Excalibur, the mysterious quest for the Holy Grail are the stuff of legends. But the most recent Hollywood movie bearing the King's name has elevated Arthur from a courageous ancient king into an inspiring modern leader. The secret knowledge this Arthur bears is not of sacred relics or mystical powers, but of the art of leadership that inspires ordinary men to perform extraordinary deeds. The story takes place in 4th Century Britain during the last years of the Roman conquest. Hadrian's Wall divides Britain across the middle. South of the Wall the Roman governors and their legions rule, suppressing the aspirations of the countless tribes of Celts, Scots, Angles and such who have migrated to this island over the centuries, fought, subdued and ruled its local inhabitants, and been subdued in turn by the Romans who conquered by superior military might and ruled by superior organization. North of the Wall, the indigenous Woads of Scotland led by Merlin live wild and free. The task of maintaining Roman supremacy in Southern England has fallen to bands of Sarmatian knights, fierce horsemen whose ancestors were conquered by the Romans on the Russian steppes and forced to offer successive generations of their children as indentured soldiers for periods of 15 years service in the Roman armies. During the last days of Roman rule in Britain, these knights are led by Artorius Castus, son of a Roman father and native British mother. Raised in England on the ideals of freedom and equality proclaimed by Roman philosophers, Arthur served his God and country as a sacred privilege. Unknown to Arthur, Rome has long ago abandoned the noble ideals he learned as a youth and murdered the philosopher who was his teacher. But these ideals have lived on in Arthur and he has embodied them in his every act. As he says, "Deeds are meaningless unless they serve a higher purpose." Though his men have been forced into military service, he treats them with the regard of close kinsman and is as covetous of their lives and well-being as he is of the Roman citizens they serve. Though charged to rule the local inhabitants by force of arms, he abstains from all unnecessary cruelty and loss of life. In his mind, all are endowed with equal rights as citizens of the Empire. Arthur's knights have served bravely and honorably their 15 year term. The last six of the original band who have survived are now to be released from their bonds and free to return to the Russian homeland they left when still boys. Bishop Germanius, an emissary from Rome, has arrived carrying the documents that will serve as their passports to freedom. But instead of delivering them from their bonds, he demands of them one last service to Rome. A huge Saxon army has landed in the North and is sweeping down to Hadrian's Wall, killing and burning all in its path. Rome has decided that Britain is no longer defensible against the incessant on-slaught of attacks which have weakened the empire at many points, so it is withdrawing its forces from the country. North of the Wall, live Marius Honorius, a close friend of the Pope in Rome, and his son Alecto who is destined to become a high serving member of the Church. The Bishop calls upon Arthur to lead his knights on their most dangerous mission to rescue Marius and Alecto from the invading army, so that they may return to Rome with Germanius. Arthur recognizes the danger and accepts the task as a part of his duty as a Roman soldier. But he vehemently protests the imposition of this task on his Sarmatian knights, who have served Rome with distinction and have earned their freedom. When Arthur informs his men that they are compelled to undertake one more mission in order to obtain their passports to freedom, none are willing to serve Rome a day longer. But neither are they willing to abandon Arthur at this critical moment when he needs their support. Reluctantly his six knights accept the charge put on them and ride off behind him to complete one last mission. Reaching Marius and Alecto just hours before the descending Saxon hoards, Arthur offers to lead their family to safety. At the same time, he warns all the local Woad inhabitants of the impending Saxon invasion, frees those that have been imprisoned, and offers to take those who cannot escape by themselves. Encumbered by a large caravan, Arthur's small band is attacked by a few hundred Saxons while crossing a frozen lake. The fearless courage and self-sacrifice of his knights enables them to successfully ward off the attack and escape to the Wall. Until now Arthur has demonstrated the prowess of an able general and the fairness of a just, good man, but his true emergence as a visionary leader is yet to come. Arthur's knights have finally earned their freedom and obtained their rights of passage. The Roman army is withdrawing from Hadrian's Wall. Thousands of defenseless Brits will be left to be murdered by the Saxon marauders. As the caravan of Romans leaves the Wall accompanied by his knights on their way to freedom, Arthur chooses to remain behind and fight the Saxons. Arthur does not seek to persuade his knights to remain. Rather he urges them to take the freedom they have earned. 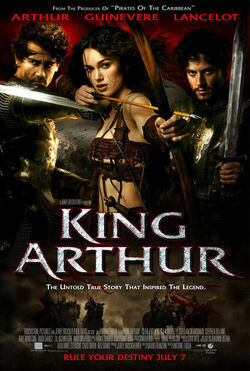 But in secret league with Merlin, Geneviere and their outnumbered Woad fighters, Arthur prepares a trap for the Saxons. As the Sarmatian Knights ride away from danger, they see their former leader alone astride his horse on a hilltop overlooking Hadrian's Wall. Their horses slow as if unwilling to proceed further, then gradually one by one they turn to rejoin their leader in this final and most likely fatal battle. Here for the first time, the Sarmatians follow Arthur not because they are compelled by force of obligation, but because they choose to do so of their own free will. They follow a more compelling force than the force of authority. They are compelled by an ideal and an inspiring example that captures their minds, engages their hearts and releases their energies for heroic deeds. Together Arthur, his knights and the Woad forces face and defeat the larger Saxon army and send it fleeing from England back to Norway. Following their unexpected victory, a half-British Arthur weds the Woad Lady Geneviere and is crowned by Merlin as the first king of the united people of Britain. In many ways Arthur is the prototype of modern leadership. He knows and cherishes the value of each individual human being. His high values and genuine personal concern for those he leads brings out the very best in all who follow him. Refusing to live for himself alone or his own success and aggrandizement, he inspires others to transcend their own narrow self-interest and give of themselves for a large cause. Refusing to favour one people as superior to another, he comes to be recognized by all as a man of superior character and leadership ability whom all can willingly follow. Can one man and a handful of followers make such a difference to the life of an organization or a nation? They can and they do. Every great accomplishment is the result of one or a few people who rise above the ordinary to perform extraordinary deeds. What makes them extraordinary? It is not their talent or strength. It is their attitude and determination. What can motivate men to such an attitude and determination? Neither the power of authority, nor the force of compulsion, nor the threat of punishment. It can only be accomplished by acts that are self-chosen in an atmosphere of freedom in pursuit of a challenging and inspiring goal that unites and benefits all rather than divides and deprives. The true essence of leadership is to create that atmosphere of freedom, project that inspiring goal and motivate people by determination and example to the highest conceivable levels of accomplishment. For such a leader and followers, anything is possible.